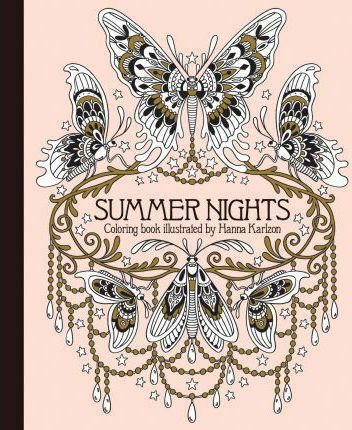 This new volume of the bestselling Hanna Karlzon's artwork has 85 illustrations of starry nights, fanciful gardens, underwater creatures, fantastic portraits, and more. Linger over long Scandinavian evenings, and watch the stars appear in the latest whimsical world of Hanna Karlzon's creating, "Summer Nights." New and old adherents to the coloring phenomenon will fall in love "Summer Nights Coloring Book." This 96-page hardbound edition lends a luxurious feel, encouraging artists to display on the coffee table or bookshelf. Complete your Hanna Karlzon collection with the hardbound "Daydreams Coloring Book, " the "Daydreams Artist's Edition" with 20 oversized art card illustrations, and "Daydreams" and "Winter Dreams" postcards to color and share with friends. Hanna Karlzon is an Umea, Sweden-based illustrator and creator of the best-selling coloring books, "Dagdrommar" and "Sommarnatt, " previously published in Sweden. She creates elaborately detailed images using India ink to detail pictures from her own imagination and loves to draw flowers, forests, houses, and animals. She draws her inspiration from the natural world that surrounds her studio in northern Sweden and adds in some art nouveau, punk rock, and often a hint of '70s design to the mix.